Last year, Harvard ran Hearing Modernity, a series of lectures on music and torture, violent and sadistic listening, grand narratives of sound, and more. This weekend, MIT ran a somewhat similar symposium called Seeing / Sounding / Sensing. “Sounding Bodies – Music by Alvin Lucier and Arnold Dreyblatt” wrapped up the two-day event. Faculty Director and Kenan Sahin Distinguished Professor of Music, Evan Ziporyn, introduced Lucier adding that he was “the perfect person to end the symposium.” It was also explained to me that this evening’s sold-out program marked the start of a four-concert series ending in April with Terry Riley. It was back in the ’60s when Ivan Tcherepnin, John Adams, and I, together, first encountered Alvin Lucier somewhere in Boston. 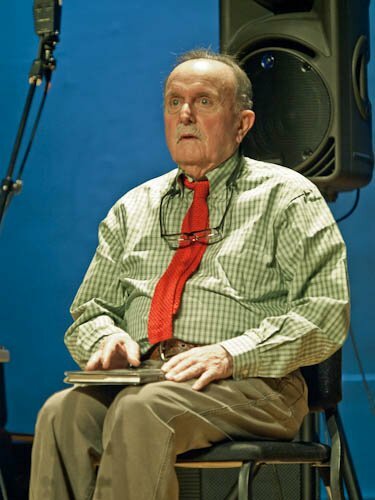 Lucier had electrodes attached to his head; his brainwaves were to set a large gong in motion. The result was hardly a sound. At Saturday night’s event, Michael Brodeur of the Boston Globe told me that Lucier addressed that problem at one of the earlier presentations by admitting that timpani works a lot better. “I am recording the sound of my speaking voice and I am going to play it back into the room again and again until the resonant frequencies of the room reinforce themselves so that any semblance of my speech with perhaps the exception of rhythm is destroyed. What you will hear then are the natural resonant frequencies of the room articulated by speech. I regard this activity not so much as a demonstration of a physical fact, but more as a way to smooth any irregularities my speech might have.” I Am Sitting in a Room from 1969 continues to intrigue. 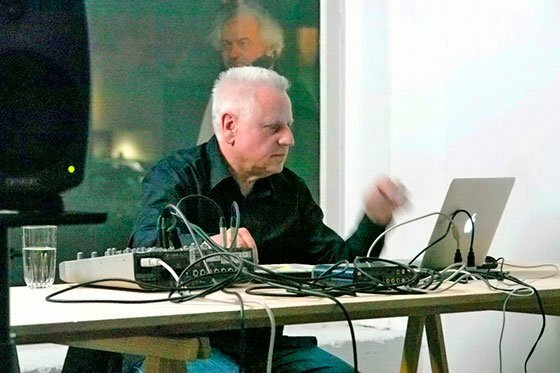 The performance time, too, was a surprise—30 minutes—instead of the 40-45-minutes of speech slowly evolving into resonant frequencies that most of us were expecting. Someone had commented before the show that the room, MIT Media Lab E 14-674, was dry. Comparing this live performance to one on YouTube [here], I would say it was less lush, less colorful. There were essentially three wordless “voices” that materialized, a lower drone and a high tambourine-like sound appearing intermittently, and the central part of the polyphony, a melodic figure uncannily resembling a blues lick. This caused me to think of Steve Reich’s Come Out. And whose came first, Reich’s or Lucier’s? Reich takes the words “open the bruise up, and let some of the bruise blood come out to show” looping them over and again finally to create a bluesy kind of piece of minimalism. Come Out, it turns out, was composed three years earlier, 1966. Was it coincidence? Granted, each piece arises from different techniques, different concepts. Another seminal work of Alvin Lucier, In Memoriam Jon Higgins for clarinet in A and slow sweep, pure wave oscillator dates back to 1984. Evan Ziporyn soloed. Over the span of 21 minutes, long, drawn-out tones begin low, eventually winding up high, with pitch creating rhythm. Again, this is pure, simple, lovely, and fascinating, if a bit wanting.